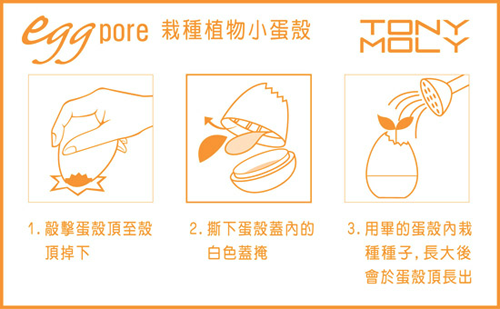 Here it is, my first product review and for one of my favourite beauty brands; TONY MOLY. The brand's presence is still quite new to the country and if I'm not mistaken, the stores only started opening around Manila in 2011, not too long after Etude House branches started springing up too. I'm glad stores for TONY MOLY are now in the Makati area too (although the only one I've seen so far is in SM Department Store, next to the InterContinental Manila hotel), since the first branch I ever saw was all the way in Ortigas in SM Megamall. Though I've seen this product many times whenever I browsed through a TONY MOLY store or stall, I finally decided to give it a try. I was immediately attracted to it because I'm willing to try anything that promises to focus on removing or minimizing/reducing blackheads. There are many days where I simply don't have the time to properly apply foundation and concealer and have to settle for quick BB cream applications to lightly mask and even out my skin, and as we all know, BB creams technically still aren't foundations so sometimes imperfections like blackheads are still quite visible. Basically, a product that will remove or reduce them would save me more time and energy in the end. 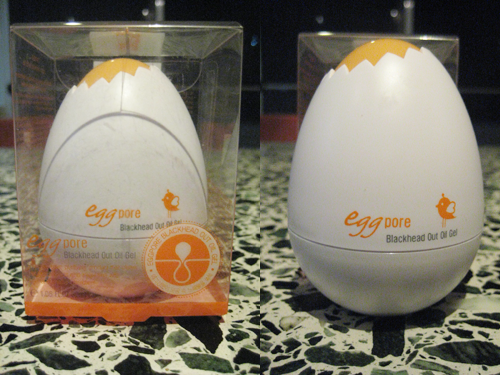 Here's the product itself, both in its original plastic packaging and out of it. Super cute, right? 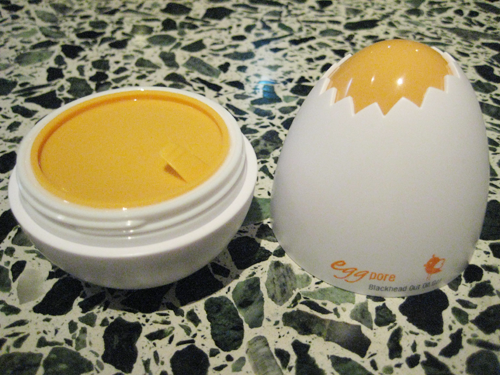 When you twist open the top half, the actual product is sealed with a soft, rubber cap which you simply pull off. Important note: Be careful when pulling it off because it removes easily and you can end up accidentally spilling a bit of the product itself. You have to be even more careful when placing it back on! Since it's so soft and flexible, even when you try to seal it again gently the cap will 'fall' into the product and cause spill over again. Here's a tip though: place the bottom half on a flat surface and apply a light, even pressure all around the cap when pressing it back on to seal the product in. It just takes some practice! The actual product. As you can see, it's semi-translucent and contains hard, yellowy orange beads that are common in a lot of other beauty products meant for cleansing or exfoliation to provide that extra buffing and cleaning power. It also has a light, almost citrus-y scent to it. Ta-dah! 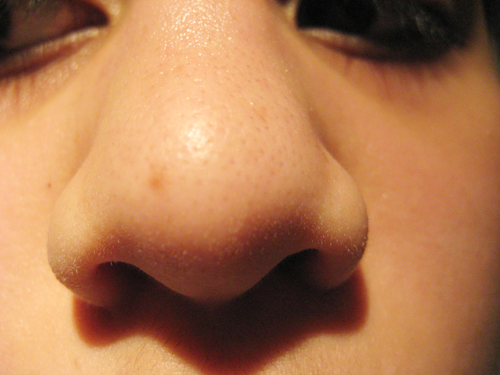 Here's my nose (where my more visible blackheads are located), before applying the product of course. In all fairness, my blackheads aren't extremely obvious unless you look at my skin really up close, but I still consider them quite unsightly (it doesn't help that I also wish my pores were smaller) and always try my best to conceal them. Here I've already washed my face (best to start with clean skin after all), applied the product, and began massaging it in. According to the instructions, "Apply an appropriate amount onto areas with blackhead and gently massage for 3 to 5 minutes", then rinse off with lukewarm water. The product that started off translucent actually turns milky white when you begin massaging. The package states "This clear oil gel turns white because it combines with sebum while massaging." 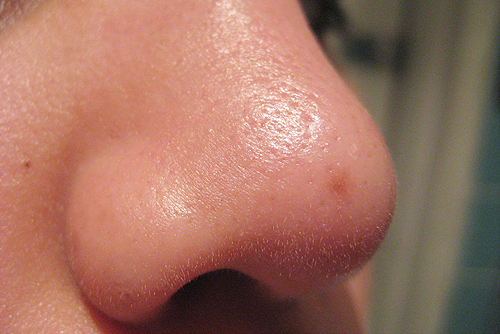 As you can see, I applied it to the skin around my nose too because I have visible pores there and want to get rid of anything hidden in them and perhaps prevent future blackheads. Haha. You can see a couple of the orange beads in the picture too. The results! Okay, no major or immediate effects here. 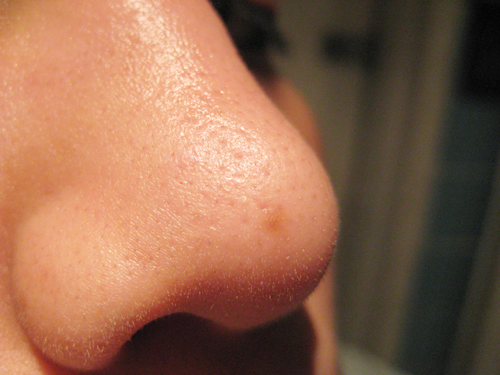 I still have most of my blackheads, but I do think some of them actually lightened a little bit? Although, I can't be completely certain. What do you guys think? Another picture from a different angle. I originally intended to try out this product over the course of two weeks, applying it twice a week. But from other reviews I've read, a handful of people already received immediate and positive results after using it only a couple of times so I decided to do it quicker: applied it yesterday evening and tonight as well. Immediate and positive results weren't the case for me, I think. Perhaps my blackheads are too deep-seated to fully remove in such a short time? It did reduce the darkness of some and remove them though, so that's good! As a plus, if you have dry skin on wherever you applied it to, it moisturizes the area and maks it smoother. I won't judge too quickly however, especially since I do have stubborn blackheads, and will continue to use this product regularly and after 2 or 3 weeks, I'll make an update entry for you guys concerning any 'progress' regarding the product and how it's fared with me. Oh, and just so you know, the product's packaging has a bonus feature! Once you've finished up the product completely, you can actually use the container as a nifty, plant pot. You have to 'crack' open the top, yellow part off, regularly water the seeds that are contained inside it, and give it plenty of sunlight of course. That's all! Unfortunately, I can't show you guys this since I clearly still have to wait until I've used up the entire product...sorry! It lightened and removed some of my more obvious blackheads. Moisturizes and smoothens any dry areas you apply it to. Environmentally friendly packaging since you can re-use the container as a plant pot. You don't need to apply too much of the product or apply it too thickly since it spreads so smoothly and easily. This means the product should last you a long while even if you use it 2-3 times a week (I don't recommend this for daily use, just make sure you do it regularly). 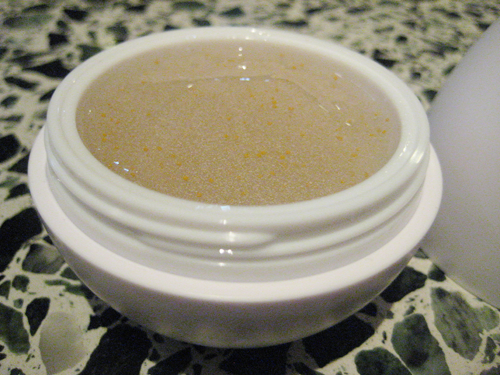 You can use it absolutely anywhere on your face that you have blackheads, like your chin or forehead. The yellow rubber cap is a nightmare to put back on, especially if you're not used to doing it and nonetheless, the risk of the product spilling over is always there even if you've used up most of it. If you have stubborn or deep-seated blackheads like me, you may need to use this product regularly for a longer time to see more significant results. I've always been curious about this product. Thanks for the comprehensive review! Yeah, I think the formula of the product isn't meant to really dig into the pores and dissolve the blackheads if they're that deep seated or concentrated. But I'll see if I get any improvements after a couple of weeks, at least. Maybe in this case it's a how long and how regularly you use it, and not exactly how much you use per application sort of thing. And yes, the environmentally friendly packaging is a definite plus! You're welcome, Rowena! :) Glad you liked it. By the way, congratulations on your first review. I love that your entry is very informative, straight to the point and enlightening. Definitely give it a try. If anything, at least it does give your nose or anywhere else you apply it a good clean which of course will prevent more blackheads, acne, etc.And thank you so much! I want to make sure my readers get as much information as possible concerning the products so their shopping options become much easier, and I like to toss in any tips or tricks if I can. :) I'll post my next review some time next week. I'm just using it up to be honest, but sadly I won't be repurchasing either! I wanted to like this but it seems like it's not that great since most have said it does little to remove blackheads. The packaging still gets me though...however I shall refrain from spending money just for the totally awesome and cute packaging. Yeah, it hasn't been very effective for me either. In the end, it just seemed to act like an exfoliant for my nose because it made it softer and smoother, but that's about it.